A hands-on guide to implementing Web services and Service Oriented Architecture (SOA) with today's Java EE 5 and Java SE 6 platforms. Author Mark Hansen presents in explicit detail the information that enterprise developers and architects need to succeed, from best-practice design techniques to state-of-the-art code samples. RESTful services are stateless. As Fielding writes in Section 5.1.3 of his thesis, "each request from client to server must contain all the information necessary to understand the request, and cannot take advantage of any stored context on the server." RESTful services have a uniform interface. This constraint is usually taken to mean that the only allowed operations are the HTTP operations: GET, POST, PUT, and DELETE. REST-based architectures are built from resources (pieces of information) that are uniquely identified by URIs. For example, in a RESTful purchasing system, each purchase order has a unique URI. REST components manipulate resources by exchanging representations of the resources. For example, a purchase order resource can be represented by an XML document. Within a RESTful purchasing system, a purchase order might be updated by posting an XML document containing the changed purchase order to its URI. Fielding writes that "REST-based architectures communicate primarily through the transfer of representations of resources" (Section 5.3.3). This is fundamentally different from the Remote Procedure Call (RPC) approach that encapsulates the notion of invoking a procedure on the remote server. Hence, RPC messages typically contain information about the procedure to be invoked or action to be taken. This information is referred to as a verb in a Web service request. In the REST model, the only verbs allowed are GET, POST, PUT, and DELETE. In the RPC approach, typically many operations are invoked at the same URI. This is to be contrasted with the REST approach of having a unique URI for each resource. These are the basic principles behind REST. However, when people talk about the benefits of RESTful systems today, they usually are not strictly applying these principles. For example, among REST advocates, keeping shopping cart data on the server and maintaining a session related to the shopping process that is using the cart is acceptable.2 In fact, the XML/HTTP Binding provided by JAX-WS for implementing RESTful services provides for session management capabilities using cookies, URL rewriting, and SSL session IDs. More significant deviations from Fielding's definition of REST involve getting around the "uniform interface" constraint by embedding verbs and parameters inside URLs. The Amazom.com REST interface, for example, includes verbs in query strings and doesn't have unique URIs for each resource. Systems like this, although labeled as RESTful, are really starting to look very much like RPC using XML over HTTP without SOAP. For the purposes of this book, I am not going to wade into a debate on what is or isn't RESTful. I simply define RESTful Web Services in contrast to SOAP Web Services. Table 3–1 illustrates the principal differences. a. Some would argue that XML Schema could be used as an interface definition for RESTful services. Not only is that approach possible, but it is used in many practical cases. However, it is not a complete interface solution because many, if not most, RESTful services incorporate HTTP parameters (e.g., URL query strings) in addition to XML as part of their invocation interface. Chapter 9 looks at the Yahoo! Shopping RESTful interface, which uses HTTP parameters in this manner. This is consistent with common usage in the REST versus SOAP debates. REST uses simple XML over HTTP without a WSDL interface definition. In addition to introducing RESTful Web Services, this chapter introduces and reviews some basic techniques for integrating Enterprise Information Systems (EISs) using XML, XSLT, HTTP, and Java. For each example, I demonstrate how to implement it with and without JWS. The versions of the examples without JWS use basic Java HTTP and XML techniques. Both approaches are provided to give you a sense of what is really happening, under the covers, when a Web service is consumed or deployed using JWS. This should give you a better understanding of the mechanisms underlying JWS and when to use them. For simple Web services, often it is easier to work with the basic Java tools than to pull out all the power of JWS. On the other hand, you will see from these examples how things can quickly get complicated and require the power of the JWS technologies. The first step toward implementing an SOA component that consumes or provides EIS records involves formatting the EIS records that need to be exchanged as XML documents. This process is formalized by creating an XML Schema to represent the structure of an XML document for a particular EIS record. This section introduces some simple examples that are used throughout this chapter to illustrate the role of XML and XML Schema in SOA-style applications development based on Web Services. Understanding these examples requires a basic knowledge of XML and XML Schema. If you are new to XML, you should get an introductory text such as Beginning XML by David Hunter et al. [Hunter]. For the necessary background on XML Schema, I suggest Definitive XML Schema by Priscilla Walmsley [Walmsley]. Alternatively, if you know basic XML, but need to brush up on XML Schema, you can probably find all you need to know for this book by reading through the W3C's "XML Schema Part 0: Primer" [XSD Part 0]. To illustrate how XML is used, I employ an example based on the fictitious XYZ Corporation. The example illustrates real SOA challenges faced by many companies. XYZ Corporation has an Order Management System (OMS) that needs to be integrated with a Customer Service System (CSS). The OMS should be thought of as an EIS, such as SAP, for taking customer orders and tracking them through delivery. The CSS should be thought of as an EIS, such as Oracle's Siebel Customer Relationship Management Applications, that is used by customer service employees as a tool for handling customer inquiries. XYZ Corporation would like to build an SOA application bridging the OMS and the CSS. Every time a new order is entered in the OMS (or an existing order is updated), the new SOA application should transfer that information to the CSS and add it to the relevant customer's history log. The purpose of this SOA application is to ensure that customer service representatives have fast access, through the CSS, to basic customer order information. If customer service representatives need access to more detailed order information from the OMS, the CSS will contain the keys within the customer history log (updated via the SOA application) to query the OMS and access that detailed information. 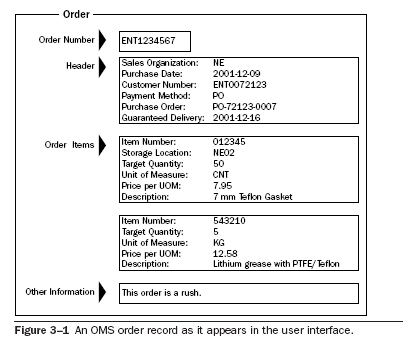 Figure 3–1 illustrates what an OMS order record looks like as it might appear on a user interface. Visit the Prentice Hall Professional website for a detailed description and to learn how to purchase this title.